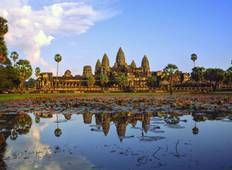 Explore a varied offer of budget discovery tours that will take you through some of the most renowned destinations such as Angkor Wat and Siem Reap. Each affordable tour will provide you with memorable experiences for some of the lowest prices on the market. "This tour is ideal for travelers who seek general structure (hotel bookings and large..."
"It was an amazing tour and the organization and the guide in Angkor Wat was really..."
"Honestly.... this could have all been done on my own rather than through Bamba Experience...."